All text and photographs (unless otherwise stated) have been graciously provided by Peter Lovell. The page is laid out with the information presented mostly in chronological order. However some of the pictures may not be in strict date order, being fitted into the text because of their location or specialised working rather than the date of the photograph. This is only the first cut for this page, more photographs will be added shortly. As a teenage train spotter in the mid to late 1960's, Exeter was a rather insular place. Westerns and Warships from the local depots at Newton Abbot and Laira dominated most services, plus the occasional Hymek and NBL Class 22s on the lighter freights. A key feature of the West Country is what heads west is likely to come back a few hours later, especially on the Paignton line services. In the days when the inter-regionals (or cross-country trains) changed engines at Bristol, the locomotives that worked to Bristol in the morning would return in the afternoon. Summer Saturdays were better, a more intense passenger service, mainly more of the same with a few Class 35 Hymeks from Bristol Bath Road and Cardiff Canton, a handful of class 47s and from 1967 the occasional class 45/46. An additional Waterloo – Exeter ran with a pair of Crompton Class 33s, but only as far as Exeter Central. We would cycle up the hill to Exeter Central for a quick glimpse over the wall, before hurrying back down to St Davids again, hoping that we had not missed something rare. During the 1967 school summer holidays we had heard that a late morning freight arrival at Riverside Yard was sometimes a Class 45/46 and we would cycle out to Cowley Bridge to see it ease over the crossover into the yard. (This is identified elsewhere as the 07:00 Severn Tunnel Junction). Some of the earliest Class 45/46 workings were on motorails from Newton Abbot. I can recall going to Exeter St Davids after school one Friday in about May 1967 to see the first Newton Abbot – Newton le Willows train of the season, only for D1660 City of Truro to appear. However the next morning a handful of Class 45/46s appeared on Paignton trains as a Bristol Bath Road crew could easily complete a round trip to Paignton within a normal shift. On an evening in the late 1960's a pair of NBL Class 22's approach Starcross heading to Newton Abbot with the empty stock of the 15.00 Waterloo - Exeter. Exeter St Davids depot in the late 1960's with Class 42 Warship No.870 'Zulu' and NBL Class 22 No.6334 standing in front of the former coaling tower. A visit to Bristol Bath Road Open Day on October 21st 1967 included seeing ten Class 45/46s during the course of the day. In contrast to the busy summer Saturdays, weekday passenger traffic was less intense by current standards, although trains were often heavier. The Paddington service was mainly every two hours, and would split at Exeter, about ten coaches going forward to Plymouth and Penzance and the last three to Paignton. A Warship would wait in South Devon sidings, and once the main train had departed would back down onto its lightweight load waiting at the far end of the platform. A few minutes later it would come bombing down the platform taking advantage of its high power to weight ratio. Until the end of the 1960s the inter-regionals to Manchester and Liverpool ran via Hereford and Shrewsbury, with only trains for the Midlands and North-East routed via Birmingham. I recall going to Plymouth for the day in 1967 leaving Exeter at about 08:25 on what subsequently became the 06:35 from Bristol. The train was then an overnight from Manchester to Plymouth that included sleeping cars and a coach from Glasgow. Towards the end of 1966 I acquired a newspaper round that provided the funding for trips away. Initially most trips were to Bournemouth or Weymouth to see the final steam on the Southern. Once this finished in July 1967 Bristol Temple Meads was the destination of choice. At 7/6d (37.5p) for a child day return (I was small for my age then!) it was more expensive than Newton Abbot (2/6d) or Plymouth (5/-) but apart from the occasional D600 Warship at Plymouth you saw the same locomotives as at Exeter. At Bristol in those days you saw Peaks (45/46s), Brush 4s (47s) and the occasional Brush 2 (31s) and English Electric 3 (37s) in addition to the WR hydraulics. The Class 45/46s were the main interest. Compared to the compact Hymeks and Warships they seemed enormous for their power output. They would come lumbering off Bath Road Depot, their 16 wheels squealing over the points, and reverse into one of the short holding bays at the north end of Bristol Temple Meads station, ready to take over a Midland line train. On summer Saturdays we would spend all day on the platform as there would be a steady stream of holiday trains. By mid-day probably over 100 train-spotters would be congregated on the two long island platforms located opposite Bath Road Depot. I can recall one Saturday afternoon after a succession of Class 45/46s and 47s a great cheer went up as a Class 40 slowly wound its way along platform 12, its turbo-charger providing a distinctly different sound. In the late 1960s the number of Class 45/46s at Bristol was not that great because the Manchester and Liverpool trains were still running via Hereford and Shrewsbury with hydraulics or 47s. So on weekdays, after spending a while at Temple Meads we moved on to Newport or Cardiff with their constant stream of freights or to Woodhams Yard at Barry to clamber over the steam locomotives. I can recall returning from Newport one evening in about 1968 on a Manchester – Plymouth service. A Western came off Ebbw Junction depot and waited at the east end of the station by the signalbox. The train from Manchester ran in with a Class 47 and the locomotive uncoupled. The Western then backed onto the other end and we departed for Plymouth. During the Easter holidays in 1968 we went to Birmingham to visit the various sheds, using the itinerary provided in the Ian Allen Locoshed book. In those days you could only get day returns for journeys of up to 75-100 miles so we had to re-book at Bristol. We arrived at Bristol behind a Warship and after checking that it was changing for a Class 45/46 and not a 47 we raced to the ticket office to re-book to Birmingham. After departing from Temple Meads I had expected the train to take the route up Filton Bank, and was somewhat perplexed when we took the Midland route via Fishponds and Mangotsfield. At the end of 1967 a Coal Concentration Depot was opened at Exmouth Junction on the site of the former goods yard. Initially this was served by a direct service from Manvers Main Colliery near Barnsley. This normally arrived at Exeter St Davids mid-morning with a Class 45 and would be banked up to Central. In later years I think the tendancy was to trip the coal up from Riverside Yard. In October 1968 the first of the Warships were withdrawn, with a few more in 1969. During the winter of 1969 Laira and Newton Abbot crews learnt Class 46s (presumably Class 45s at the same time). Locomotive shortages precluded any more withdrawals until 1971 by which time theClass 45/46s had ‘got their feet under the table’ and dominated most of the inter-regional trains. The end of the summer timetable in October 1971 saw the withdrawal of the final Class 43 NBL Warships and a number of the Swindon built examples. The Exeter – Waterloo services were taken over by the Class 33 Cromptons. Laira received its first allocation of Class 25s in 1971 to replace the NBL Class 22s and take over some of the lighter Warship turns, particularly on the Barnstaple line where the weight restriction on the bridge at Umberleigh was insufficient for other Type 4 diesels. At the same time all of the Westerns were transferred to Laira with Bristol Bath Road receiving Nottingham’s allocation of Class 46s. The arrival of the Class 46s at Bristol coincided with the start of the withdrawal of the Class 35 Hymeks. A few went in September 1971 with the majority in 1972. Visits to Bristol during 1972/73 would include a visit to St Phillip’s Marsh, on the avoiding line at the rear of Bath Road Depot where withdrawn Hymeks would be stored pending disposal. St Phillip’s Marsh (or SPAM) was then used for stabling multiple units although it has since become one of the main HST depots. Class 46 No.159 waits outside of Bristol Bath Road depot sometime during 1972. Class 46 D140 departs from Newton Abbot with the 1E37 10.50 Paignton - Leeds 'Devonian' during the winter of 1971/72. Class 25s had arrived in South Wales in 1970 with both Classes 25s and 31s at Bristol Bath Road. A regular turn for a Bath Road 25 in the early 1970s was the 4B10 16:00 Bristol – Plymouth parcels. The locomotive would then return as a pilot on the 18:00 Penzance – Bristol. Being a pilot locomotive it was a single man turn. I recall a driver telling me than one night soon after leaving Exeter the cab door flew open, but being single manned he was unable to close it until Taunton for fear of allowing the dead-mans pedal to activate. In about 1968 a number of the Paddington services were booked for pairs of Warships, this continued until May 1970. From then on weekday Paddington trains were hourly each way. Westbound there was an hourly departure from 07:30 until 19:30. The 08:30, 10:30, 12:30, 14:30, and 16:30 ran to Paignton, the remainder to Penzance or Plymouth. London bound the Paddington trains were generally scheduled to leave Exeter at 50 minutes past the hour arriving at Paddington 2 hrs and 45 minutes later. Five of these originated at Paignton, departing at 07:55, 09:55, 11:55, 13:55, and 15:55 with the remainder from Penzance or Plymouth. On Fridays there would be a couple of extras running up during the day and returning from Paddington at 16:53 and 18:27. Additionally the 08:00 Bristol – Penzance returned as the 14:00 Penzance – Birmingham. All of these services were normally Class 45/46 hauled. This timetable of Paddington and inter-regional trains remained unchanged until the arrival of HSTs in 1980. Winter Sundays were very quiet, and lasted from October until the end of April, with little traffic in the morning. When the pairs of Warships were operating we would occasionally go to Plymouth on a winter Sunday afternoon, travelling down on the 10:30 Paddington – Penzance non-stop. A brisk walk out to Laira, entering through the gates at the back of the old steam shed. There was little moving on a Sunday afternoon, with no one working on the maintenance side to challenge our visit. Return was at about 17:00, normally with the same pair of Warships. However passenger traffic was only part of the story. The M5 motorway did not reach Exeter until 1975 and the road network was slow and congested, so the railways supported most aspects of life. In additional to regular freight services, parcels, mail, milk, perishables and newspapers were all carried by rail, with a range of dedicated trains. There were also a number of motorail services during the summer months, although these fell off from the mid 1970s with the arrival of the motorway. With the routing of all inter-regionals via Birmingham (at the expense of the North and West Hereford-Shrewsbury line) all northbound traffic out of Bristol was concentrated on the Filton route, leading to the closure of the old Midland line via Mangotsfield. This enabled Bristol Parkway station to open in May 1972, situated at Stoke Gifford where the Bristol-Birmingham and London-South Wales lines crossed. This enabled us to travel from Exeter to Cardiff locomotive-hauled all of the way, avoiding the all station Bristol-Cardiff DMUs. A Class 46 arrives at Bristol Parkway with the 1E30 08.30 Plymouth - Sheffield sometime during 1972. As mentioned previously the passenger service in Devon and Cornwall varied considerably depending on the time of year. In the early 1970s Barnstaple was the only branch with a winter Sunday service comprising three trains each way. Exmouth and the Cornish branches had no service from the end of September until May. BR was seeking to close Paignton – Kingswear, so although it had 13 weekday services each way there was not even a summer Sunday service in 1972, despite the line running through some of the most concentrated tourist areas. On the mainline things were not much better on winter Sundays. After the 23:45 Paddington - Penzance had left Plymouth at 06:50, the next departure along the Cornish mainline was the 10:30 Paddington – Penzance leaving Plymouth at 15:20. At Exeter things were slightly better with a northbound inter-regional and a Paddington - Plymouth train each way. Occasionally they would be diverted via Yeovil and Castle Cary due to engineering work between Exeter and Taunton. Class 45/46s could be seen on the Newcastle, Newton le Willows, Sutton Coldfield and Sheffield services. By today’s standards the advantages of motorail travel do not appear to be great. The Sunday 23:50 Sheffield – Newton Abbot arrived at 05:50, with passengers (sleepers and compartments) required to vacate the train by 06:45! Apart from the locomotive depot there can have been few attractions at Newton Abbot at such an early hour on a Monday morning. Whilst the St Austell motorail terminal was mostly associated with the unloading and loading of holidaymakers and their cars, it occasionally served other purposes. On a a very dull April 9th 1979 25225 has arrived at St Austell with a trainload of twelve new BR vans for unloading at the terminal. The final Class 42 Warships were withdrawn at the end of 1972. This coincided with the allocation of six Class 46s to Laira in October of that year. The first Westerns were withdrawn in 1973 and further Class 46 allocations were made until October 1975 as the number of Westerns in service reduced. I believe that a handful of Class 47/0s were transferred during the same period, and from 1974 the Class 50s started to appear. I travelled to Laira to photograph some of the last surviving Warships on November 17th 1972. Travelling down on the 07:04 Derby – Plymouth hauled by 24, and returning with the same locomotive on the 13:05 Penzance – Leeds. My notebook for the day also records 11 on the 07:45 Penzance – Liverpool, 83 on the 10:55 Paignton – Leeds and 18 on the 11:20 Plymouth – Manchester. At Laira I saw 818, 806, 820, 829, 814 and 832. Class 31 5692 was also on shed. Arriving back at Exeter I discovered that the 10:30 Paddington – Paignton and 15:55 Paignton return were in charge of 821, resulting in my travelling to Taunton behind it. On December 3rd 1972 the 16:00 Bristol – Plymouth was worked by 821, the last revenue earning service for a Warship. A grim scene at Laira depot, on the site of the old steam shed, as withdrawn Warships 818, 806, 820 & 829 wait for their final movement to Swindon Works for breaking up. Storage Yard (Old steam shed): 7068, 7074, 7054, 821, 1032, 1067, 818. Maintenance Shed: 1065,153,14, 7573, 7574, 1048, 1002, 1059, 1046, 1009, 1024, 1072, 1001. Yard outside of Maintenance Shed: 2134, 2128, 1063, 1052, 1027, 4017, 4129. Running Shed: 19, 1060, 1010, 5818, 1069, 1026, 1052, 1068, 1056, 1040, 1036, 1005, 7505, 148, 1034. Total 42. The February 10th 1973 saw Exeter City FC playing away at Hereford United. The Exeter City Supporters Club organised a special, and we learnt that it was open to anyone willing to pay. We turned up hoping for a Western but ended up travelling to Hereford behind 188 on eight coaches. Rather than watch the match we caught a DMU to Worcester, where the 16:15 to Paddington had 7018. We took this to Evesham returning to Hereford with 7030 on the 15:15 from Paddington. A dull day at Newport in about 1972. An unidentified Class 46 approaches with a very varied mixed freight, judging by the exhaust the train has a clear road through the station. A pair of Class 25's, with 5181 closest to the camera run round their train at Newport in about 1972. A Dalescroft Railfans Club trip to Bristol & South Wales on May 27th 1973 found seven Class 25's stabled at Ebbw Junction. In this line up are 7516, 7518 in green livery, 7520 & 7505. With the arrival of the Class 46s at Laira they slowly started to appear on any of the Western workings apart from the Paddington turns. This included a range of freight including the St Blazey - Etruria ‘clayliner’ to Washwood Heath, parcels and passenger trains such as the 18:00 Penzance – Bristol. In about 1974 a daily Cardiff – Plymouth and return was introduced that connected into both north and southbound workings of the Bristol – Glasgow sleeper and was generally a Western or Class 46. Later on the sleeper was extended to Plymouth and the Cardiff ceased to run. 45041 approaches Liskeard on May 2nd 1979 with the 04.24 Stoke (Etruria) - St Blazey. The Looe branch swings off to the left, with the platform set at right angles to the main line. In the 1970s fertiliser and cement went down the steeply graded branch and clay came up. In addition to the passenger trains, the 1970s saw a wide range of other traffic that slowly declined over the next 20 years. Freight trains were numerous with oil, coal, cement, bitumen and a range of general materials heading west, while clay, scrap metal and ballast from the quarries at Meldon and Stoneycombe went in the other direction. Most of the passenger trains included a GUV or BG for bagged mail, ordinary parcels and Red Star parcels including perishables such as daffodils from the Scillies. Fresh fish would also be carried in polystirene boxes. The water from the melting ice and fishy odour would give away the contents of these parcels. Mail was carried on the Penzance – Paddington Travelling Post Office (TPO), this left Penzance at about 19:30 every Sunday – Friday evening. The westbound train left Paddington at about 22:30 with on-board sorting carried out in both directions. The London bound reached Exeter at about 10:45, and although the TPO did not carry passengers there would always be a number of people on the platform to meet it as you could post letters directly into the TPO vehicles, and they would be delivered in London the next morning. The Station Inspector would always supervise operations as BR paid the Post Office a penalty if the train ran more than 10 minutes late. At Bristol the Post Office staff would swop over with their London colleagues on the westbound working. Connections would also be made with the Milford Haven TPO for South Wales traffic, often hauled by one of Landore’s boilered 37s, and the 01:10 Bristol – Sheffield. The latter was mainly the stock of the 18:00 Penzance – Bristol, and in later years was advertised as a through train. Newspapers were carried on the dedicated 00:30 Paddington – Penzance newspaper train. This split at Taunton, the first portion going forward to Plymouth and Penzance, while the latter portion followed it to Paignton dropping off at Exeter and Newton Abbot. The newspapers were packaged up for the various wholesalers en route, after the train had departed from Paddington. Each evening a group of newspaper packers would travel up from Plymouth on the 16:10 Penzance – Paddington, immediately recognisable by the large balls of string that they carried. The empty newspaper vans from Plymouth and Paignton returned early in the morning as 5A06 to Old Oak Common. The Penzance vans worked back on one of the afternoon parcels trains via Bristol. Milk was conveyed to London in six wheel tankers. The main train was the 16:40 St Erth that picked up at Lostwithiel and Totnes. The destination changed over the years as the train terminated at various dairies in the London area. During the spring and summer when milk yields were high an additional train ran departing from St Erth at 13:50 At Exeter tanks would be added from Torrington and Lapford on the Barnstaple line and Chard Junction on the former Southern main line. The tanks from Uffculme on the Hemyock branch would be tripped down to Exeter or added at Tiverton Junction. Bringing this traffic into Exeter to attach to the London bound trains were regular turns for the Class 25s working from Exeter Depot. The tanks had a maximum speed of 55mph loaded or 50mph empty and were normally booked for Westerns with their high tractive effort for the heavy loads. This was not always popular with the train crews as the maximum wagon speed was just below the point when the transmission on a Western changed from the second to third stage and the locomotive would start to develop a bouncing motion. The Uffculme traffic changed to road in 1975 and by 1980 the traffic had ceased to run, either transported by road or as a result of changes in the dairy industry. The 14:00 Penzance – Birmingham was similar. The six passenger coaches went down as the 08:00 Bristol – Penzance and returned as the 14:00 to Birmingham with vans attached at both Penzance and Plymouth. All of these trains (with the exception of 4A13 to Paddington) provided regular work for the Class 45/46s. The only truly mixed train was the 07:50 Barnstaple - Exeter stopping at all stations. This comprised two passenger coaches and a handful of four wheel ‘Fruit D’s limited to 45mph that were retained for the mail and parcels traffic from Exeter to Barnstaple. In the late 1970s these would go down as the 03:00 Exeter – Barnstaple. The 04:05 Exeter – Barnstaple DMU would also have a newspaper van attached to the rear off the 00:30 Penzance – Paddington Newspaper train. At Barnstaple the DMU would return at about 06:17 while the 07:50 would bring back the stock off the 03:00 Exeter and the newspaper van. A regular 25 turn during the 1970s, it could often produce a pair on Saturdays, one off an unbalanced freight working. The 04:30 Exeter Riverside – Barnstaple freight locomotive would normally fill in with the trips to Torrington and Meeth. It would then return as the 19:15 Barnstaple – Exeter Riverside bringing back clay, milk and empty wagons from Barnstaple. At Exeter the milk would be attached to the 16:40 St Erth – Kensington Olympia. On Saturdays the milk didn’t run so if there was no other traffic the locomotive would doublehead the 07:50 mixed back to Exeter. The balance of this was that the 11:15 Exeter St Davids – Barnstaple on a Sunday would be double-headed, the spare engine bringing back the milk. Overnight there were two Penzance - Paddington trains each way. The 00:50 Paddington – Penzance and 22:10 Penzance – Paddington were both all sleeper trains that called at the main stations in Cornwall and then ran non-stop from Plymouth to Paddington, with a crew change at Taunton. The 23:45 Paddington – Penzance and 21:05 Penzance – Plymouth travelled via Bristol and called at main stations. These also included a couple of sleepers and one or two GUVs for motorail. These services attached/detached a sleeper at Exeter. The up train departed from Exeter at 01:42. Until the early 1970s a boiler van was stabled in the former Exe Valley platforms at Exeter to heat the sleeper. When this ceased to function the sleeper would be shunted into platform 6 and a boilered locomotive from the depot used to steam heat it. This was normally a Class 25 or a Western. The locomotive would normally be parked at the bottom of the stairs from the covered footbridge with the engine running. After a while on a still night the stairs and footbridge would be completely full of diesel fumes. 1973 saw the Paddington services dominated by Westerns and the inter-regionals by the Class 45/46s, with class 47s popping up occasionally on any of the main-line workings. The Exeter – Waterloo services were solid class 33s. Freight services could produce anything including the surviving Hymeks. In addition to summer Saturdays the bank holidays could also produce heavy levels of passenger traffic. Maunday Thursday and Christmas Eve in particular would see reliefs to all of the Paddington departures from 09:30 to 19:30, with reliefs also running to many of the inter-regionals. For the reliefs from Paddington many of the locomotivess would work up from the West Country, with ballast and freight workings cancelled or worked by Class 25/31s. The early morning departures to Paddington would be double-headed with pilots coming on at Newton Abbot (the Stoneycombe Quarry locomotive) and Exeter. Reliefs would then run to Paddington from mid-morning until late afternoon to provide the stock for return services. Withdrawn Hymeks 7054, 7097 and Warship 824 at St Phillips Marsh on May 27th 1973. The existence of rakes of Mk1 stock retained primarily for summer Saturday and bank holiday reliefs, also meant that stock was available for excursions and charters. In addition to the normal passenger service a wide range of extras classified as Adex, Milex, Footex and Chartex originated from the West Country, and also arrived in the opposite direction. In particular bank holidays and summer Sundays would see ‘Merrymakers’ from the Home Counties and Midlands for Dawlish, Teignmouth and Torbay with a wide range of motive power. On May 12th 1973 BR organised a Plymouth – Aberstwyth excursion that produced 1038 to Shrewsbury with 5142/5092 forward to Aberstwyth. 1038 Western Sovereign stands at Shrewsbury on May 12th 1973 with an excursion headed for Aberystwyth. For some of the spotters/excursionists the 'No Trespassing' signs at the of the platform are purely for decoration only? At the other end of the train green liveried Class 24's 5142 & 5092 will handle the trip to the coast. During 1973 the first Westerns were withdrawn including the vacuum braked quartet 1017-1020. On April 16th 1973 I travelled to Bristol on the 07:35 Plymouth – Edinburgh with 1020 double-heading 1909. With a train of 427 tons net the 30.75 miles from Exeter to Taunton were covered in 25 minutes and 12 seconds. Two days later on Maunday Thursday both 1018 and 1020 worked reliefs from Paddington. Both locomotives were withdrawn on June 4th 1973, so these were some of their final passenger workings. The same day also saw the 07:04 Derby – Plymouth work with a pair of Class 25s. The use of the Laira Class 25s on passenger services around Exeter was on two routes. There had never been a surplus of DMUs allocated to Laira, and it was normal practice over the years for some of the Paignton main-line sets to start or finish their turns with a couple of local workings. The Waterloo sets would also be similarly used when running to or from Newton Abbot for servicing. Some of the Barnstaple line services had always been locomotive hauled. On weekdays this was normally the 07:50 Barnstaple – Exeter that conveyed the empty mail, newspapers and parcels vans. In the afternoons the 15:55 Exeter and 17:55 return (this altered slightly over the years) were also locomotive hauled, the return train was contracted to the Post Office to carry mail. The afternoon train was formed of the four coaches and van that worked down on the 06:23 from Salisbury. After arrival from Barnstaple in the evening the stock went forward to Basingsoke, returning to Salisbury in the small hours. In the early seventies this was a regular Class 25 turn, although at various times Classes 33s and 31s were also diagrammed. With the withdrawal of the Hymeks the Portsmouth – Cardiff services had reverted to DMU working. From May 1977 an hourly service diagrammed for Class 31s was introduced. 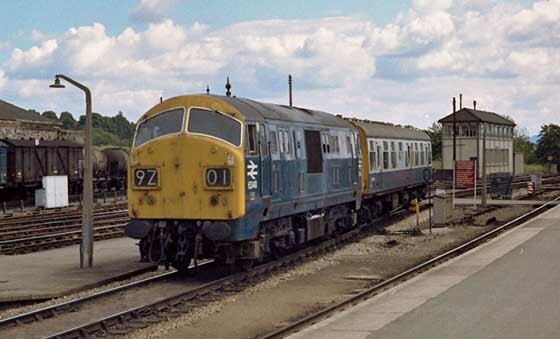 A spin-off of this was that the afternoon Barnstaple and Basingstoke train then became a Class 31 turn. On Summer Saturdays the DMUs on the Exmouth branch doubled up and all of the Barnstaple trains would be locomotive hauled until the evening. The bridge restriction at Umberleigh banned all the remaining BR type 4 locomotives so a Class 25 and four coaches would cover the bulk of the services. The stock for the 10:10 Exeter – Waterloo would form an early outward service and then return as the 08:32 Barnstaple – Exeter hauled by a Class 33. The through Paddington train also ran on Summer Saturdays. Until the early 1970s this would have been a Warship or a Hymek, easily handling the eight coach load. From 1973 this became a Class 31 turn with seven or eight coaches, and a much greater challenge. The Old Oak Common 31s spent most of the week working ECS, short van trains and engineers trains and were not a great success on the Worcester services. A 430 mile round trip to Barnstaple on a hot summer Saturday often ended with a failure on route. On June 30th 1973 nemesis struck. 1055 arrived at Exeter early in the morning with the 5A06 returning newspaper vans and had been placed at the depot entrance as stand-by. Unusually there were no other Type 2 or 3 locos on the depot that day, perhaps a Class 31 had been despatched with the newspaper vans. The Paddington – Barnstaple duly arrived with 5823 in BR green lined livery. It was uncoupled and moved forward onto the line to Exeter Central to run around. Just before it reached the ground signal that protected the other through lines, and which controlled it’s return, it stopped dead. No amount of coaxing would get it to move. The assistant area manager took immediate and decisive control, bellowing across the station to fetch the stand-by. To the amusement and slight amazement of the assembled observers 1055 was duly despatched to Barnstaple, and after safely crossing the bridge at Umberleigh took the return train back to Paddington. With the train crew clambering down from both cabs, 5823 stands stranded at Exeter St Davids on June 30th 1973. In the evenings the Class 33 off the 15:00 Waterloo would return to the Southern with ballast from Meldon and the stock would be worked to Newton Abbot by a Class 25. On weekdays this followed the 17:30 Paddington at 20:15, on Saturdays it followed the 14:35 Leeds at 20:40. I travelled on this train five times during 1974 recording 25133, 25227, 25274, 25326 and 31112. Until about 1973 the intermediate stations between Exeter and Dawlish had a sparse service, particularly the popular seaside resort at Dawlish Warren. From about 1973 (possibly 1974) additional locomotive-hauled summer stopping trains were introduced, calling all stations from Exeter to Paignton. The times varied over the years but generally there were two or three return trips a day. Although both the Barnstaple and Paignton trains were diagrammed for Class 25s they never totally dominated the trains with Class 31s making regular appearances, until they took over the services in 1980. However, the bulk of the Class 25s work around Exeter was on local freight. On the Barnstaple line they worked the milk from Torrington and Lapford, ball clay from Meeth and general freight from Barnstaple, although in later years this was mainly cement and resin. Fertiliser was also regularly delivered to Lapford, King's Nympton and Torrington. In the early 1970s there was sufficient traffic at Barnstaple to warrant a Class 08 shunter. On the former Southern main line there was milk traffic from Chard Junction, Whimple yard received deliveries of sand and gravel and despatched cider from Whiteways. There was also a daily trip to the MOD depot at Newcourt near Topsham on the Exmouth branch. Around Exeter the local trips were shared with Class 08 shunters and included cement to Exeter Central, coal and wagons for repair at Exmouth Junction, scrap metal from Marsh Barton and bitumen to City Basin. Until Exeter Gasworks closed in 1972 it would also have included coal for producing gas and coke. The Heathfield Branch from Newton Abbot despatched ball clay and received heating oil from South Wales, although the latter did not normally involve Class 25s. Until October 1973 I had worked in the catering industry normally from 15:00 - 22:00, this gave me all mornings free. From October 1973 I started working in the courts (a proper job according to my mother) staying there for 34 years. This involved normal office hours finishing at 16:30 most days and with weekends free. With the completion of the West Coast electrification the first batch of Class 50s were released. Initially they appeared on a number of Paddington services, but the number reduced after a few weeks due to availability problems and the need to concentrate them on the air-conditioned Paddington – Bristol services. The period from 1974 until the end of 1976 probably saw one of the greatest varieties of locomotives between Exeter and Newton Abbot with Classes 25/31/33/45/46/47/50 and 52 all likely to appear during the course of the day. In Cornwall it was normal to see four different classes of type 4, probably one of the few areas of the country to do so. BR Excursions in 1974 included an 06:20 Exeter – Barmouth on June 16th with 47110 to Shrewsbury and 24085/24137 forward, returning as the 19:00 Barmouth – Exeter. On June 30th a Plymouth – Oxford and return was 47063. Things improved the following week, July 7th, with 1050 on the 07:00 Plymouth - Barry Island and 17:55 return. From 1975 as more Class 50s were released and the Westerns withdrawn, the balance moved in favour of the Class 50s on the Paddington trains. Nevertheless, life in 1975 continued much as before. On May 17th 1975 I travelled to Meldon Quarry behind 1063 returning as far as Crediton where 25224 and 25161 took over for the run to Torrington. The Class 25s noted on local services included 25059, 25093, 25153 and 25275. In August 1975 I was promoted and transferred to Bristol, travelling home at weekends. I would often return on Sunday evenings on the 18:00 Penzance that ran to Paddington on a Sunday. It was a steam heat Mk1 set so normally a Western. Departure from Exeter was at about 22:15 with arrival at Bristol just before midnight. It stood at Bristol for about an hour before continuing to Paddington. On a number of occasions I would wake up at Bristol to find that the train had been standing there for over thirty minutes, fortunately I was never carried on further. In 1975 the layout at Gloucester was rationalised with the closure of Eastgate Station and all traffic concentrated on Central Station. Inter-regionals calling at Gloucester now had to reverse at Central. This altered some of the locomotive diagrams and saw some of the remaining Westerns appear on inter-regionals again. The most common turn was the afternoon 14:38 Paignton – Leeds. This was formed of the stock off the 06:38 Leeds – Paignton with the locomotive coming up light engine from Laira. After working to Gloucester the locomotive returned on the 14:35 Leeds – Plymouth. On August 22nd 1976 25223 & 33017 depart from Lapford with the 11.15 Exeter - Barnstaple. 33011 waits to leave Barnstaple with the 08.25 to Exeter on May 27th 1978. The line from Barnstaple to Ilfracombe had closed in October 1970 just as the 25s were arriving. The track was then left in situ for a few years while negotiations took place with a group hoping to buy the line and run it as a preserved railway. Sadly this failed to come to fruition and BR decided to lift the track and sell off the land and buildings. On February 26th 1975 a party of engineers undertook a survey of the line with an inspection saloon hauled by 25063. This was the first train to run over the track for four years and was also the last train. During the summer of 1976 occasional summer Saturday trains would produce pairs of Class 25s. Favourites were the 09:47 Leicester – Paignton and the 12:20 Birmingham – Paignton. On the August 14th 1978 I travelled to Crediton behind 25200 (then allocated to the LMR) on the 13:45 Exeter – Barnstaple, returning with the late running 12:20 Barnstaple hauled by 25223. Soon after arriving back at Exeter, 25211/25209 rolled in with the 09:47 Leicester. On Sunday mornings the 11:15 Exeter – Barnstaple was often double-headed, the additional engine working to Torrington for the milk. On the August 22nd 1976 I travelled on this train to Lapford with 25223 and 33017, arriving at mid-day for opening time in the pub. Closing time coincided with the arrival of 25080 on the 14:15 Exeter for a Sunday afternoon snooze to Barnstaple and back. In addition to the three ‘foreign’ 25s hauled on August 14th, that summer I also travelled behind 25080, 25169, 25170, 25217, 25219, 25220, 25223 and 25225 on the local services. With notebook in hand an enthusiast records the details of 25211 & 25029 as they head west through Dawlish on August 14th 1976 with the 09.49 Nottingham - Paignton. This train was booked a pair of Class 25's from Nottingham to Derby and a Class 45 forward. If a Type 4 was not available it meant a run down to the West Country for the Type 2's. A slightly surprising move in September 1976 (given the move to ETH) was the transfer of two withdrawn Class 24s to Laira and Newton Abbot for carriage heating. Fortunately I had my camera with me when I arrived at St Davids Station to find 24054 and 24142 being stabled on the depot. An interesting development in the 1976 timetable was a Summer Saturday 09:10 Falmouth – Paddington. For most of the summer this was a Class 50 and it seemed unlikely that a Western would work it before they were all withdrawn. Then almost at the end of the summer timetable, on Friday 17th September, 1041 in poor external condition, unusually worked the 17:30 Paddington – Penzance. The next morning I left Exeter at 04:57 behind 1009 on the 23:35 Paddington – Penzance. Soon after arriving at Truro 1041 duly arrived with the ECS to form the 08:22 Truro – Falmouth. After arrival at Falmouth in the morning mist the train reversed out to the run-around loop before reversing back to form the Paddington service. Its a misty September 18th 1976 at Falmouth as 1041 Western Prince awaits departure with the 09.10 Falmouth - Paddington. The locomotive and its six coaches had arrived with the 08.22 from Truro. In addition to locomotive changes during the 1970s the coaching stock situation slowly evolved. At the start of the 1970s everything was formed of Mk1 vacuum braked stock. Steam heat was the order of the day, although the stock working to the North-West via Birmingham must presumably have been dual heat. From about 1971 MK11 air braked stock appeared on the Paddington – Penzance services and from 1973 on the Paddington – Paigntons. From the mid 1970s Mk11 stock appeared on the Plymouth – Edinburgh, Penzance – Leeds and Paignton – Leeds services. Although dual heat stock only the steam heat was utilised. With the introduction of the Class 50s and the occasional Class 47/4, eth became more common. From about 1977 the introduction of HSTs enabled air-conditioned stock to be cascaded onto the Paddington services and Mk11 stock onto the remaining inter-regionals. For the final tour from Paddington a friend in Exeter organised a coach as it worked out cheaper and was slightly more convenient than the over-night from Penzance. Looking back it illustrates the impact of the arrival of the M5 motorway. Rail charters and excursions for sporting events, west-end shows and events such as the Ideal Home Exhibition had been common, but now lost out to coach travel. However the arrival of the M5 did not appear to have much impact on scheduled passenger services which increased, possibly as a result of population increases. On Fridays there had always been a couple of additional Paddington – Plymouth trains at 16:53 and 18:27. From the mid 1970s the 16:53 started to run every day. In later years the 08:30 Paddington – Paignton was diverted to Plymouth with a lighter train at 08:36 for Paignton. The passing of the Westerns brought home to me how few photographs I had from the hydraulic era. Although I had often taken a camera with me travelling on, and photographing trains, these often left you with only a selection of platform end or station photos. I thankfully made a conscious decision to shift the balance from travelling to photography. At that time there was still plenty of the ‘traditional’ railway left in terms of signalling, variety of traffic and locomotives etc. In August 1976 I had transferred from Bristol back to Exeter, and in 1978 obtained a post as a relief junior manager spending much of the time at the small courts in Cornwall when the regular managers where on annual leave. Compared to Exeter and Bristol, life was relatively relaxed in the Cornish courts and it was easy to slip off to the station for a couple of hours at lunch-time or be away soon after the offices closed to the public at 16:00. Regular locations were Penzance, St Austell, Liskeard and Bodmin, so Lostwithiel and Par were also easily accessible. With the introduction of HSTs on the Paddington – Bristol – South Wales routes air-conditioned stock was cascaded onto the Paddington – West of England services. From 1977 the Class 50s dominated the Paddington services but also worked as far as Birmingham on some of the inter-regionals to Birmingham and Manchester. Their ETH capability enabled single man operation, and was the first challenge to Class 45/46 dominance on the inter-regionals. On a damp September 11th 1976 25218 & 25258 head east through Exeter with the return empty coaching stock from the 09.49 Nottingham - Paignton. A mixed scene at Exeter depot during September 1976. Amongst the expected Type 2's, shunters and railcars are Class 24's Nos 24054 & 24142. Rather than have groups it would have been better if all locations were available every week to spread the load. One week the 07:45 Exeter – Waterloo and onward connection to Southampton and Portsmouth (a Class 31 and six coaches from Cardiff) would be packed, while the following week it would be trains to Birmingham. In the run up to Christmas Birmingham was very popular for shopping and I recall the 06:25 Plymouth – Manchester leaving Taunton so full that two additional coaches were added at Bristol. In 1976 the Cardiff- Crewe services went from DMUs to Class 25s with rakes of six Mk 1s. The cheap Saturday trip to Crewe allowed travel either via Birmingham or Hereford. The 06:25 Plymouth – Manchester made the 12:20 Crewe – Cardiff at Crewe that we would take to Nantwich or Shrewsbury. After an afternoon in the pub we would travel down to Newport on the 16:00 Crewe – Cardiff, dozing down through the Welsh Marches with a Class 25 chuckling away on the front, the steam heating oozing gently from under the coaches. From Newport we would travel to Bristol, either direct or via Parkway, the latter offered an hour in the pub at Stoke Gifford. On a Saturday night this entertained this local rugby team who purchased beer in a two gallon watering can. From Bristol we would travel home on the 21:20 Bristol – Plymouth. This was normally a Class 46 on four steaming Mk1s and a few vans. The 75 miles to Exeter would take nearly two hours, even though Saturdays produced little mail or parcels for the generous station stops. 25047 runs into Shrewsbury with the 11.50 Cardiff - Crewe on an overcast December 3rd 1977. The other favourite were the weeks when Swansea was available. A number of the West Wales services were locomotive-hauled as the coach/locomotive diagrams involved mail or overnight trains. After arrival at Swansea we would go forward on the 12:00 Swansea – Fishguard. This was normally a Class 47 that re-engined for a Class 37 at Carmarthen. Return home was normally again by the 21:20 Bristol – Plymouth. Looking back, life now seems much more sophisticated and complex. Then for a ticket costing about £2 you could spend a day travelling around behind various locomotives and visiting pubs from Crewe to Carmarthen. There can be few things more relaxing, after a couple of hours in a pleasant pub, than snoozing home in a warm compartment, lights dimmed, with the steam heat hissing gently. Towards the end of 1977 the first sign of future change in Cornwall appeared with the transfer of 37142 to Laira, for crew-training by St Blazey depot. The following year it was joined by 37267. Once the 37s were passed for the various branches they worked turn and turn about with the 25s, the heavier turns often worked by a 25 and 37 in multiple. BR had decided that future needs required only one class of Type 2 locomotive and the 31s were the preferred type, so the days of the 25 were numbered. Soon after its transfer to Cornwall, 37267 came up to Exeter on July 23rd 1979, where it did a spot of shunting at the station. Whilst in the middle of these duties it managed to fall off the track! 1978 proved to be a severe winter in the West Country. On Sunday February 19th the ‘Deltic Ranger’ railtour was scheduled to bring the first Deltic to Devon. A previous railtour had been hit by industrial action at Finsbury Park depot and been worked instead by a pair of Class 40s with Stratford men. We planned to travel up to Paddington on the overnight from Penzance (depart Exeter 01:42) to join the railtour at Paddington. The Saturday was unseasonally cold by Devon standards, and heavy snow started to fall in the late afternoon. At the time I lived in Exminster and decided to travel into Exeter while the buses were still running. We spent the evening in Exeter and at about midnight decided to make a move down to St Davids Station. By this time the snow was between two and three foot thick. We made our way down Exeter High St by working our way under the shop awnings on the side of the road where the wind had blown the drifting snow away. On the other side of the road drifting snow was between three and four foot deep. Eventually we arrived at St Davids Station and I was glad I had heeded my father’s advice and worn Wellington boots. At St Davids a Class 31 was pottering around trying to keep the track clear. Eventually the overnight arrived from Penzance about an hour late behind 47069. It then sat at Exeter for a couple of hours before departing at about 05:00. We travelled slowly to Taunton in freezing conditions. Conditions improved slowly, and we arrived in Bristol Temple Meads at about 08:30 where the train was terminated. After the stock had departed empty for Old Oak Common we caught a train to Parkway to await the railtour. This duly arrived behind 55018 and we travelled back to Temple Meads where the train was terminated due to the weather conditions in the West Country. We then travelled to Paddington behind 55018 arriving at 14:15, where we returned on the 14:30 to Penzance behind 50025. Approaching Taunton we ran into heavy snow again. As there was no public transport in Exeter I had to walk home. After a while I was picked up and taken home by the Police in a Land Rover. They were concerned that anyone should be out in such weather. 55018 Ballymoss at Bristol Temple Meads on February 19th 1978. Major service disruptions were already taking place further west, in light of this the railtour was terminated at Bristol and re-run at a later date. The thin covering of snow in this view was just a fore-taste of the snow to be found at Taunton and Exeter, where it could be measured in feet! The journey back to Exeter found conditions worsening as we travelled westwards. At Taunton a Class 31 disappears into the gloom whilst the centre roads have already been covered by several feet of snow. On March 5th 1978 the Deltic Ranger ‘re-run’ took place with 55003. Originally the Deltic should have handed over to 1062 at Paignton for the run to Kingswear, but this was not possible. After arriving at Paignton 55003 returned to Newton Abbot for servicing, where 46003 took over for a fill-in trip to Par. Compared to the previous tour the weather was balmy with plenty of spring sunshine. At Par the majority of people on the tour made an impromptu visit to St Blazey Depot. The evening light is beginning to fade as 46026 climbs the hill into Liskeard station on April 25th 1978 with the 18.10 St Blazey - Etruria clay. A week later during the late afternoon of May 2nd 1978 Class 50 No.50028 heads eastwards with the 16.42 St Erth - Clapham Junction loaded milk tanks. Class 46 No.46027 waits to leave Penzance with the 18.08 service to Sheffield on May 9th 1978. During the late 1970s freight traffic started to fall off. The domestic coal market in particular was declining in favour of North Sea gas. The reduction in freight traffic was noticeable in Cornwall with little traffic at places like Drump Lane, Hayle Wharf and Penzance. The main non-clay traffic west of Par was fuel for Long Rock depot at Penzance and cement for Chacewater. After closure of the LSWR route to Padstow in 1967 the line from Boscarne Junction to Wadebridge had remained open for freight, mainly fertiliser from Avonmouth. By 1978 this had ceased and the line about to close, although the section from Bodmin Rd to Wenford Bridge remained open until 1982 for clay traffic. An unidentified Class 25 runs into Copplestone station during August 1978 with a Barnstaple - Exeter service. Early at Exeter on the morning of September 19th I joined a farewell tour from Derby to Wadebridge behind 25073/074. The eight coach tour had left Derby the previous evening and travelled via West Drayton and Bath. At Plymouth 25080 took over for the run to Wadebridge with reversal at Bodmin General. Departure from Wadebridge was at 12:00 with a lay-over at Liskeard to allow a fill-in trip on the Looe Branch. The stock off the rail-tour was reversed into the goods yard that was removed shortly afterwards to enable the platform to be lengthened for the forthcoming HSTs. I returned on the tour to Exeter where 25073/074 ran around, departing for Derby via Honiton and Basingstoke. 45039 leans into the curve as it arrives at Redruth with the 18.08 Penzance - Sheffield on April 20th 1978. On Sunday mornings from the winter of 1979 the line from Exeter to Taunton was closed due to engineering work in Whiteball Tunnel. This was to continue for some years. Trains were diverted via Yeovil Junction and Castle Cary. The only regular Class 45/46 hauled train to be diverted was the Plymouth – Edinburgh. However it was either a Class 47 or the weather was too dark. The only occasion when I managed to photograph a Class 46 on the former Southern main line was on December 17th 1978 when 46011 replaced a failure at Exeter on the 09:45 Plymouth – Paddington. Unfortunately it was running late and I had positioned myself to take a train coming in the opposite direction when it suddenly appeared behind me. Here is the view of the Class 46 on the former Southern mainline, with a smart looking 46011 approaching Fenny Bridges, near Honiton on December 16th 1978. The second coach is fully air-conditioned, the Class 46 only has steam heat, its likely it'll be a chill ride in that coach. Possibly 46011 may be replaced at Westbury..........? 1979 saw me working in Cornwall for most of the time with lunch hours and summer evenings spent between Liskeard and Par. Passenger traffic was in the hands of 46s and 50s with 25s, 37s, and 46s on the freights. As ever 47s could pop up and make a nuisance of themselves on any of the Type 4 workings. A sign of the times was the arrival of a shortened HST for crew training. 25048 approaches Cowley Bridge Junction on May 31st 1979 with the 07.50 Barnstaple - Exeter. 25206 & 25225 have arrived at Par on an overcast June 28th 1979 with a lengthy freight. The fuel tanks and cement wagons suggest this train has originated at Penzance. Class 37s were always very rare in the West Country, even when they became common on freights. In June 1979 I got married. We had bought a house in a new development on the hills overlooking Riverside Yard and St David’s Station. After the wedding we popped home briefly. Looking out of the window I saw 37050 threading down towards St Davids Station on the York – Newton Abbot motorail. Towards the end of 1979 I was offered promotion in London, and in January 1980 we moved to London bringing to an end 26 years of living in the West Country. My move away preceded the Class 25s by only a few months, while the Class 45/46s were about to enter a lingering decline that would take some years.